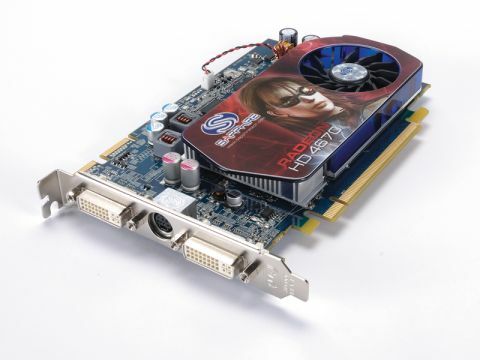 It's early days for the Radeon HD 4670 chipset, so it's no surprise to ﬁnd that Sapphire's ﬁrst take sticks closely to AMD's reference design. That's no bad thing given that it's an extremely compact single-slot card that does not require any supplementary power cables. It gets by just ﬁne with the power from the PCI Express bus. A good choice for home theatre PCs, then. It's still a fully featured board with a pair of dual-link DVI ports, support for HDMI content encryption and an adequate 512MB of GDDR3 memory. As for that 3D rendering shizzle, well, no less than 320 stream shaders deliver impressive performance for such an affordable board. The only problem is the 128-bit memory bus. It's a bit of a drag at high res and quality settings.